The Soap and Paper Factory's All Natural Hand Cream($18) in Bella is a moisturizing, scented hand cream loaded with nourishing ingredients like Shea Butter, Coconut Oil and Aloe Vera. "Our pure, velvety hand cream is beautifully perfumed and loaded with the finest oils available in nature. Carefully selected, these oils will sooth and protect, leaving your skin silky smooth and bursting with vitality. Free of paraben, phthalate, and petroleum. Not tested on animals." I love the packaging of this hand cream. The texture is quite thin but not very runny. The smell reminds me of Crabtree and Evelyn's Citron Hand Therapy. The scent is quite strong and lingers on for a very long time which is one of the reasons I prefer using this during the day. Also because it it not very thick, it works best as a day hand cream/lotion than at night. Although it doesn't feel very rich, the cream sinks in fast and keeps hands moisturized for about 4-5 hours without feeling greasy. If you have very dry hands though, this may not be something for you. It is a nice smelling, good, moisturizing hand cream with a really nice ingredients list formulated without any Parabens or Mineral Oil. Pricey, but there's a lot of product in there and the packaging travels really well too. Overall, it is light, nicely moisturizing with a fresh, crisp smell. It may not be enough during winter but, when the weather is a little warmer and my hands aren't feeling so parched, this does a good job. The Soap and Paper Factory Products are available online at soapandpaperfactory.com, amazon.com and Anthropologie stores. 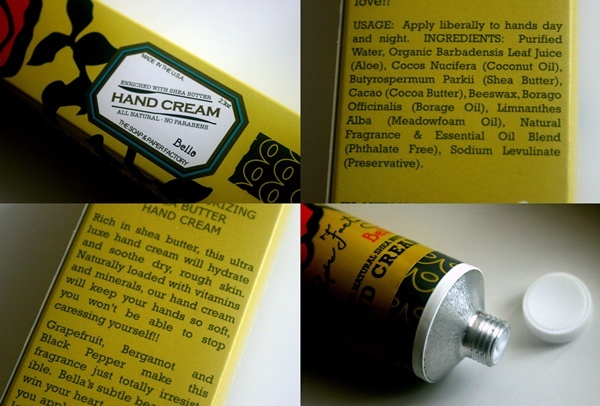 Have you tried The Soap and Paper Factory Hand Cream? hahaha and you can probably use it too :D :D I love the cute packaging on this one!